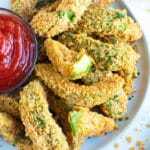 Learn how to make Avocado Fries that are coated in a delightful tortilla chip crust and then baked in the oven for a healthy, gluten-free and dairy-free side dish or appetizer! Cut each avocado in half, remove the pit and skin, and then slice the avocados into 8 slices. Place tapioca starch, ¼ teaspoon salt and ¼ teaspoon pepper into one bowl and mix until well combined. Place egg and milk in another bowl and whisk until combined. Put crushed chips, cumin, paprika, ¼ teaspoon pepper and ½ teaspoon salt in a third bowl and toss until mixed. First coat avocado slices in tapioca starch bowl, then egg wash, and then coat each slice with the tortilla chip mixture. Do this until all avocado slices are used. Place coated avocado slices on a parchment paper-lined baking dish. Spritz each slice with non-stick cooking spray. Bake avocado fries for 10-12 minutes. Serve immediately and enjoy! Select avocados that are still firm to the touch and not fully ripened for best results. You can also use arrowroot starch or corn starch in place of the tapioca starch. If you cannot find Beanito's chips, no worries! Try to find a more fragile tortilla chip (like Santita's or Xochitl) instead of a really sturdy chip. This will ensure your coating gets finely crushed and will coat the avocado slices easily.